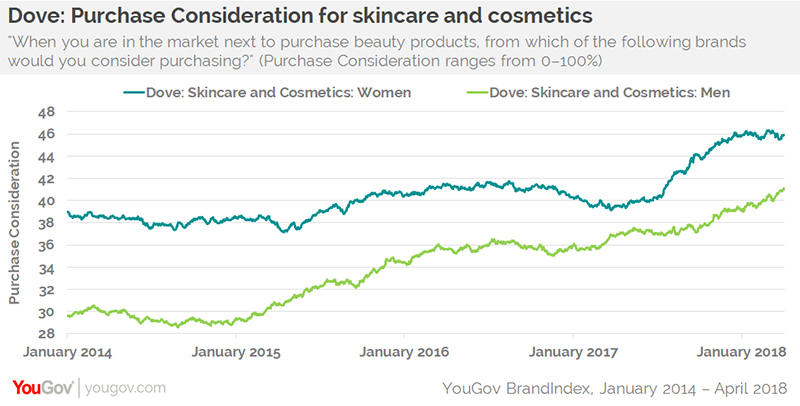 Dove can now safely say it is a two-gender brand: over the past several weeks, men have equaled women in their purchase consideration of Dove haircare products, while successfully closing the gender gap on the brand’s skincare and cosmetics offerings, according to YouGov BrandIndex. The goal of Dove becoming synonymous with both women and men has been eight years in the making, since the launch of its Men+Care personal care products. Sharp marketing and packaging, catering specifically to men’s desire to keep things simple and useful, seems to have driven buying-habit success: since January 1, 2014, men have gone from 19% considering buying Dove for their next haircare purchase to 28% today, bringing them up to women’s levels. By comparison, the average purchase consideration score for brands in the haircare product sector has remained stable at 8% over the same time period. 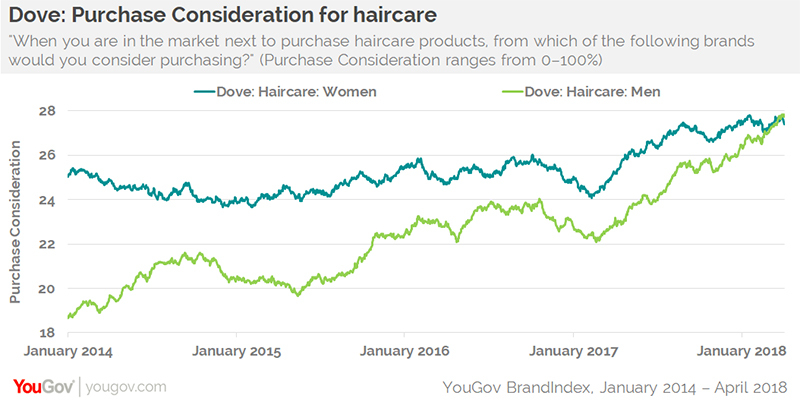 Ultimately, this means Dove now has equal potential sales volume from both genders for its haircare products. Also coming on strong with men has been Dove’s skincare products, such as moisturizers and face washes. Since January 1, 2014, men have gone from 30% considering buying Dove for their next skincare purchase to 41% – a notable jump in just over four years. The present gap between men and women is five percentage points, compared to nine percentage points in 2014. Dove scores far above the skincare and cosmetics sector average, which has been a flat 10% over this tracking period.